This week's featured mandala design is the Frosted Pink Mandala, shown above on Society6's fluffy bath / beach towel. 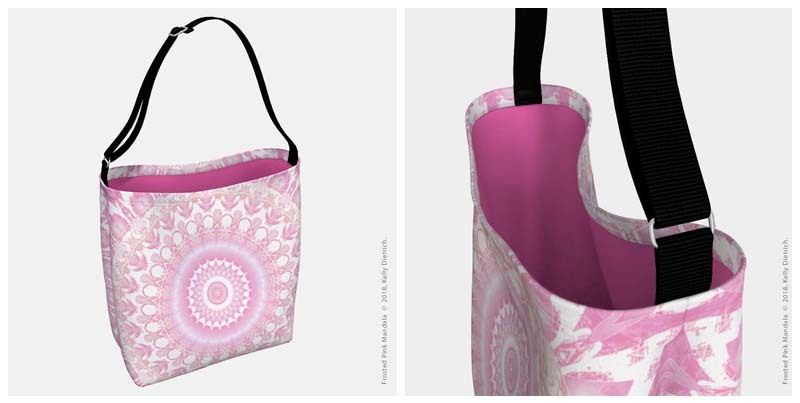 Created using on of my original fractal images, then post-processed in Photoshop, this image's beautiful pink tones and pops of white make it perfect for pink lovers. Shown below, a collage of Society6's decor items (clockwise from top left): Frosted Pink Mandala throw pillow, shower curtain, wall tapestry, and curtains. If totes are more your speed, swing by my Art of Where shop to find this design on their lovely neoprene day tote (see below). Thanks so much for taking a look at my latest design. I'll be away next week, but swing by in September to see more new designs!